The Customer is a global leader in medical devices, orthopedic implants, and spine surgery innovation. In this highly competitive space, they must balance rigorous class II FDA compliance and customer quality requirements with competitive time to market issues. The Customer relies on Fiberoptic Components as both a trusted fiber optic cable supplier as well as a partner in their fiberoptic illumination engineering projects. "We’ve been delighted by the high level of dedicated support and expertise delivered by Fiberoptic Components, particularly given our need for a custom design AND fast implementation. “ - Product Manager. The Customer had a completed design for a new minimally invasive spinal surgery retractor. 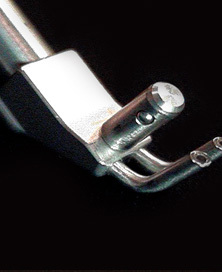 Market feedback from early prototypes suggested that they needed to integrate the illumination guide into the surgical device and miniaturize the entire assembly. Additionally, illumination guide prototypes designed by an outside engineering firm missed initial cost targets by a substantial margin and a significant cost reduction was needed to hit target price. Fiberoptic Components collaborated closely with the Customer’s engineering team on the full range of requirements including material selection, optical design, durability, connector design and overall systems integration. The initial design, complete with prototype solution, was delivered within one month. After initial customer feedback and design review, Fiberoptic Components completed the design, carefully considering manufacturing requirements, and delivered volume production from their ISO 13485 certified plant 3 months from project initiation. The Customer was able to achieve both their schedule and price targets by leveraging Fiberoptic Components engineering expertise and shortened production times by outsourcing the clean, pack and labeling operations for the light guide to Fiberoptic Components. The cost savings was nearly 8% per part and the total savings was $350K in the first 12 months. Fiberoptic Components enabled the Customer to roll out their new surgery tool smoothly to a very tight cost target and even tighter deadline.